Over the time, the speed of computers can decrease. This appears as the system taking more time to respond to a user’s actions like opening files, folders, surfing the Internet and other tasks. Here are a few steps which are helpful to make your machine (especially Windows machines) run faster. Each time Windows starts; operating memory is used to open your profile. The total amount of memory used will be small. If however, there are several or dozens of files on the Desktop lot of operating memory is used by these files, essentially for no purpose or gain. With less memory available, the computer runs slower because it has to swap out information from operating memory to the hard drive. It does this process (called memory paging) to keep everything the user wants to do running at the same time. The simple action of cleaning the Desktop will make your computer run faster. One of the first things to check on a machine that’s running slowly is how much of the hard disk has been used. If there isn’t roughly 10% of the hard disk free, it’s time to clean the HDD. One of the tools I like is CCleaner. It quickly clears out all temp files for you. One of the most common causes of the “my PC used to be fast, and now it isn’t!” complaint is actually the presence of malware. Malware can sneak onto a computer in a zillion different ways and quite often it sits in the background slowing your machine as it sends out spam emails, searches for other computers to infect, works on cracking cryptography, or performs any number of the other nefarious tasks that hackers like to use their botnet slaves for. 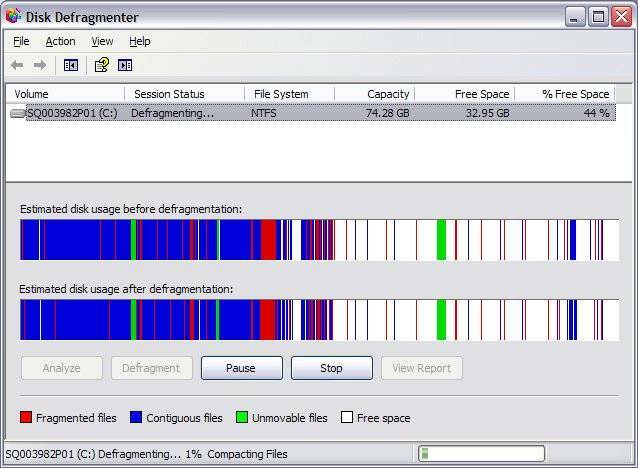 Defragmentation is the process of physically organizing the contents of the mass storage device used to store files in to the smallest number of contiguous regions. Defragmentation places all parts of a file together in the same place on the drive. It organizes all directories and files according to how you use your computer. After this process is complete, your computer will most likely run faster. Make sure your data is backed up to another medium like pen drive, DVD or external HDD. Close all the running programs including virus scanner. Assure your computer has a constant source of power. If you have frequent power outages, you should not use a defragmentation program without a battery backup. Note: If your computer does shut off while defragmenting, it may crash the hard drive or corrupt the operating system, or both. If your computer is slow, it may be because your hardware isn’t getting the job done. How will you find that out? By using the Windows Experience Index, found in Windows Vista and Windows 7. This will show you where your computer is weak, and what you would need to beef up to turn your PC into a screamer. You can speed up the computer with a flash drive. Through the magic of a Windows technology called ReadyBoost, your PC can see a real speed increase. It’s a little-known Windows secret that can help you zip on down the Information Superhighway, or make whatever you’re doing faster. Note: ReadyBoost is available in Windows Vista, and Windows 7 Operating Systems.